Sage is a relative to the mint family. It is common for Sage to be ground, whole or rubbed but is generally in more of a coarse grain. Sage is grown in the United States but is also grown in Albania and Dalmatia. Sage is a very popular herb in the United States and is used quite frequently for flavoring such things s sausage, pork, lamb, and other meats, salads, pickles, cheese, and stuffing. The smell of Sage is very aromatic and distinct. Sage loves to hang around in the kitchen with Thyme, Rosemary, and Basil. They work very well together. Sage is normally one of the main herbs in stuffing for poultry but is often added to lamb and pork dishes as well. Sage is very strong and should be used sparingly as a little goes a long way. Sage, like many other herbs develops its full flavor the longer it cooks and withstands lengthy cooking times which might be why it is so good when used in the stuffing for the Thanksgiving turkey that cooks for about five hours. If you grow your own Sage you will find that all you have to do is snip off the tops of the plant with scissors and add it right to your favorite recipe. Sage is still at its best when dried but if you prefer just simply place the fresh Sage leaves in a baggie in the freezer and pull them out as required. Today, Sage has no medicinal purposes to speak of but back in a different time Sage was used regularly to cure snake bites and was also used to invigorate the body and cleanse the mind. In the middle ages it was quite common for people to make a Sage tea and drink it for ailments such as colds, fever, liver trouble, and epilepsy. Although there is nothing to solidify these claims it is also said that a chewed Sage leaf applied to a sting or an insect bite will reduce the sting and bring down the swelling. Sage tea has been said to soothe a sore throat and also help in drying up a mother's breast milk and also reduces blood clots. Further it has been known to help with itching skin if it is added to hot bath water. Today, it is mainly the Native Indians who still rely on the herbal powers of Sage. The word Sage means salvation from its Latin origin and is associated with longevity, immortality, and mental capacity. Sage never loses its fragrance even after being dried out so it is often added to potpourri and is also added to many soaps and perfumes. It has been used in insect repellents and has antibacterial properties which have helped it become a preservative for many things such as meats, fish, and condiments. Sage has a musky smoky flavor and works very nicely for cutting down some of the richness in many foods. It also goes great with almost any vegetable too. Sage is definitely an herb that most people almost always have in their pantry if they do any cooking at all. Sage can keep your skin healthy and beautiful Its plant derived chemical compounds, essential oils, and vitamins make it beneficial in skin care in the following ways. Sage oil benefits as a great toner by regulating sebum production in oily complexion. You can prepare a home-made toner by boiling a spoonful of sage in about 250 ml water. Steep for 30 minutes and strain the concoction. Dab it on your face after cooling. Sage herb and its extracts have been found to be beneficial for hair in many ways. Some of the benefits of sage for hair are as follows. Sage has been used since ancient times to combat hair loss and baldness. Sage contains beta-sitosterol, a 5-alpha reductase compound which has been found to be effective in treating male pattern baldness. It is advisable to mix 3 to 4 drops of sage essential oil with equal amounts of rosemary and peppermint essential oils and dilute in 1 tablespoon olive oil. Massage your scalp with it twice a day. Sage tea can be used as a hair rinse to impart shine and luster to your locks. You can prepare it by boiling 1 tablespoon of dried sage leaves in a cup of water. This sage herb tea benefits to ward off dandruff. A combination of sage and rosemary is excellent for making your hair thicker, shinier and stronger. Sage is particularly effective in encouraging new hair growth as it improves circulation to the scalp, providing more nutrition to the hair follicles. A sage rosemary hair rinse can be prepared by boiling the two herbs in water. This herbal rinse can improve the quality of your hair and can revitalize dry and thinning hair. This can be used daily for one week or once or twice a week to maintain hair shine and thickness. Being an astringent, it reduces dandruff and prevents clogged hair follicles too. Sage can be used to darken and intensify hair color. All you need to do is use it as a final rinse after shampooing. An infusion of fresh sage leaves can darken grey hair as well as deepen the color of brown or black hair and impart shine to it. Sage can be used to prepare a setting lotion to make your hair manageable and improve its texture. Simply combine a handful of sage leaves with equal amount of rosemary. Boil them in about 6 oz. water and simmer for 3 minutes. Allow it to steep for 3 hours and massage your hair with this mixture before styling. Sage is literally a boon when it comes to the various health benefits it offers. From the Arabs to the Chinese, everyone has recognized this herb as a key to a healthy life. In fact, due to its health benefiting properties, it was awarded the title of “Herb of the Year” by the International Herb Association in 2001. Given below are some of the powerful health benefits of this aromatic herb. According to research conducted by the University of Vienna in Austria, sage possesses amazing anti-inflammatory properties. Sage tea is often used as a rinse or gargled for soothing inflammations. Sage extracts, tincture and essential oil are easily available in medical stores. They are used in medicines meant for the treatment of mouth and throat inflammation. This herb has been recommended for external use by the German Commission for treating inflamed mucous membranes of the mouth and throat. A recent German study has indicated that taking either a dry leaf extract or an infusion of sage leaf can reduce sweating by as much as 50%. It is a great deodorizer that dries perspiration and helps to eliminate body odor. Sage can be used internally for the treatment of mild gastrointestinal problems and dyspepsia. It is a great stimulant tonic which can treat debility of stomach and weakness of digestive system. Sage tea or infusion is particularly effective in this regard. Its carminative effect can remove symptoms of indigestion by stimulating upper digestive secretions, bile flow, intestinal mobility and pancreatic function. This herb can play an important role in your dental routine. It can be used as an effective mouthwash to treat gum disease, throat infections, and cankers. If you are troubled by cankers, you can simply gargle strong sage tea or freeze it into ice cubes. Pop one of these cubes in your mouth to soothe cankers. The anti-spasmodic effect of sage reduces tension in smooth muscles and can be used for steam inhalation to prevent asthma attacks. It is effective in removing mucous congestion in the airways as well as preventing secondary infections. Several studies have proved that sage leaf extract has anti-hyperglycemic properties which lower blood glucose levels by blocking the release of stored glucose from the liver. In simple words, it is effective in lowering cholesterol and triglyceride levels in type 2 diabetics. However, further research is needed to substantiate this claim. 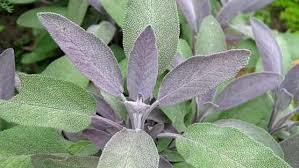 Regular intake of sage can improve memory and information processing among people suffering from Alzheimer’s. This may be because the essential oil from sage has been found to improve acetylcholinesterase (Ach) levels in the brain. This Ach enzyme improves concentration and helps in the treatment of memory loss associated with Alzheimer’s. This benefit can be attributed to the presence of astringent tannins in sage. Its estrogenic effect has been found to be beneficial for women wishing to dry up their breast milk supply or relieve hot flushes during menopause. However, there is lack of clinical data to substantiate this claim. Sage infusion is often referred to as “thinker’s tea” as it contains Thujone which is GABA and Serotonin (5-HT3) receptor antagonist. Besides improving concentration and attention span, it helps to deal with grief and depression. Three lobed sage contains a flavone called salvigenin. Its vascular relaxant effect provides protection against cardiovascular diseases. Sage oil contains volatile essential oils such as camphene, cineol, borneol and bornyl acetate, which are known for their tonic, astringent, diaphoretic, and stimulant properties. This oil can be used externally to soothe painful ailments like muscle stiffness, rheumatism, and other neuralgic conditions. Apart from this, it is used in aromatherapy to cure nervousness, stress, fatigue, tiredness, headaches, and anxiety. Sage infusion or sage tea is considered a useful medicine for the treatment of typhoid fever, biliousness, liver problems, kidney troubles, haemorrhage of lungs or stomach and measles.